Radical Islamist preacher formally charged for 'inviting support' for ISIS; arrested last year for membership in vicious terror org. Anjem Choudary, Britain's most notorious radical Muslim preacher, has been formally charged with enlisting British citizens to support ISIS. 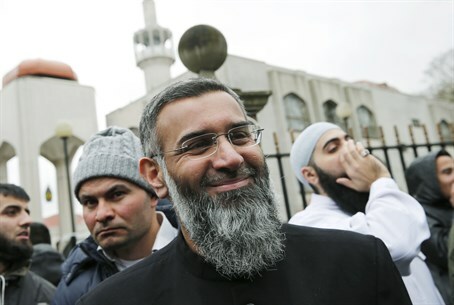 Choudary, along with one of his top proteges, stands accused of "inviting support" for the vicious Islamist terror group between 29 June 2014 and 6 March 2015, according to British media reports. The Islamist leader is a high-profile sympathizer of the so-called "Islamic State" group, and has previously founded and headed a number of extremist Muslim groups which were subsequently banned as terrorist organizations by the British government. But Choudary - a 48-year-old former British law student - has proven adept at circumventing UK anti-terror and incitement laws, avoiding formal charges despite his incendiary rhetoric - until now. In September of last year he was arrested along with Mohammed Mizanur Rahman, 32 - a notorious anti-Semitic preacher who has served time in prison for incitement - under suspicion of being members of ISIS, which is a proscribed terrorist organization in the UK. Earlier that year it was revealed Choudary had been vetting British Muslim recruits to join ISIS in Syria and Iraq, along with another Islamist leader now based in Lebanon. "Each man is charged with one offence contrary to section 12 of the Terrorism Act 2000," said Sue Hemming, head of special crime and counter-terrorism at the Crown Prosecution Service. "It is alleged that Anjem Choudary and Mohammed Rahman invited support for IS in individual lectures which were subsequently published online." The arrests follow UK Prime Minister David Cameron's vow to crack down on Islamist terrorism, incitement and indoctrination. Choudary has risen to notoriety in part due to the wide media exposure he has been granted in both liberal and conservative media outlets. He has even appeared several times on Fox News, recently clashing with anti-Islamist campaigner Pamela Geller.